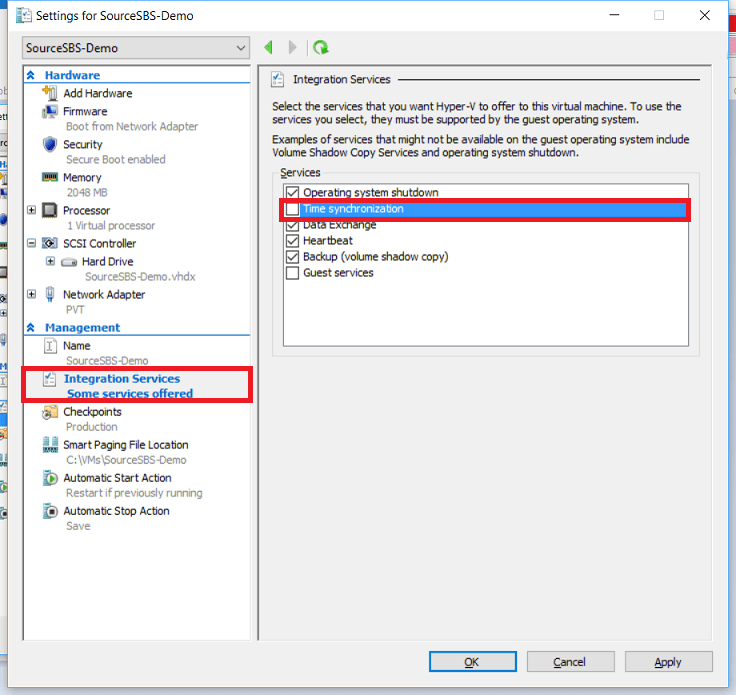 In Hyper-V virtualization, a guest virtual machine has something called “Integration Services.” By default, all of these services are pretty much enabled, including time synchronization. However, this can cause big issues if you have virtual Domain Controllers, and your physical host servers are not getting their time from a common, reliable source, such as an external NTP server like 0.us.pool.ntp.org, 1.nl.pool.ntp.org, etc. In particular, if a virtual host is running a guest Domain Controller (DC), then the DC will be getting its time from the clock of the physical Hyper-V server at start-up. There should be only one time authority on the network, which in turn should be synchronized with a reliable NTP server. Hencem, we up our virtual Domain Controller (DC01) to sync with an outside NTP server, and then set other DC02 to refer to the primary DC only. Next, on your DC01, reset the time authority. Microsoft offers a fix that helps you set an external time source such as “0.us.pool.ntp.org” . The Windows Time service is stopping. The Windows Time service was stopped successfully. The Windows Time service is starting.The Windows Time service was started successfully. Sending resync command to local computerThe command completed successfully. An Internet protocol is used to synchronise clocks of computers, for instance linux server. This protocol is known as NTP (Network Time Protocol). Following steps shows how to sync time using the terminal. Before we start login to the server via terminal and follow the steps given below. Use the ntpstat command to view the status of the NTP service on the instance. It may happen that you get an error message prompting that NTP is not installed. In that case you have to install it on the server. Use the following command to install NTP on server. After the installation is complete we need to start NTP by using the following command. For this use the following command. …and the server time will be synced. Simple Network Time Protocol (SNTP) is a simplified version of Network Time Protocol (NTP). This is used to synchronize computer clocks on a network. As name defines simplified version of NTP is generally used when full implementation of NTP is not needed. SNTP is a simplified access strategy for servers and clients using NTP. This simplified protocol is widely used to synchronizes a computer’s system time with a server that has already been synchronized by a source such as a radio, satellite receiver or modem. Interestingly, SNTP supports unicast, multicast and anycast operating modes. In unicast mode, the client sends a request to a dedicated server by referencing its unicast address. Once a reply is received from the server, the client determines the time, roundtrip delay and local clock offset in reference to the server. In multicast mode, the server sends an unsolicited message to a dedicated IPv4 or IPv6 local broadcast address. Generally, a multicast client does not send any requests to the service because of the service disruption caused by unknown and untrusted multicast servers. The disruption can be avoided through an access control mechanism that allows a client to select a designated server he or she knows and trusts. w32tm /config /syncfromflags:manual /manualpeerlist:"0.it.pool.ntp.org 1.it.pool.ntp.org 2.it.pool.ntp.org 3.it.pool.ntp.org"